Thank you for your interest in communicating with Cherokee Financial. Here is how to contact us. 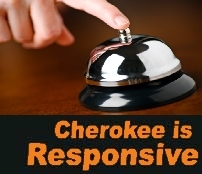 If you are a Cherokee client (someone who owes us money), please click here. Our toll-free number is (800) 543-0201. For security purposes, we do not publish a list of our staff members, or their email addresses. If you call and get a recording, please dial extension 12. This mailbox is monitored by a group of customer service representatives. Ian Richardson is the Portfolio Manager for non-performing mortgage lien assets. He can be reached at extension 12. For security purposes, we do not publish an email directory. If you know the name of the person you want to communicate with, use their full first name followed by @CherokeeFinancial.net and it will get to them. Not Sure? If you don't know who should get your email, please click here to send an email to "INFO", our General mailbox that is monitored by a rotating group of Cherokee associates. It will be routed to the most appropriate individual, who will then respond to you. You can download a 1-page PDF set of travel directions by clicking here. Please do not come to Cherokee's office without an appointment. If you have an appointment, and need directions to get to our office, you can download a 2-page set of (text only) travel directions by clicking here.